Stay tuned for upcoming events for I Love You in near future. 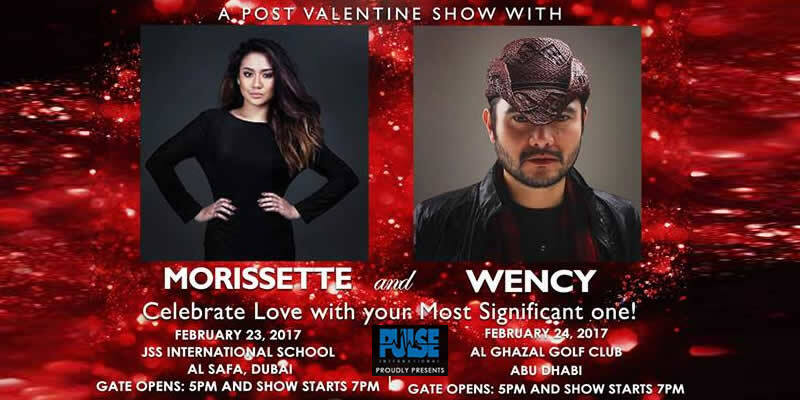 "I Love You" Post Valentines Show with Morissette and Wency is happening on 23rd February 2017 in Dubai and 24th February 2017 in Abu Dhabi. Pulse International Businessmen Services is organizing these post Valentine's Day events. Dubai show will take place at JSS Private School in Al Safa. Abu Dhabi event will be staged at Al Ghazal Golf Club. Morissette Amon and Wency Cornejo will be joined by Pulse International artists Dan, VMay, Angelo and Katrina. Best Viewed at 1024 x 768 pixels and above. This Page loaded in 0.06278 seconds on Fri, Apr 19, 2019 (06:31).